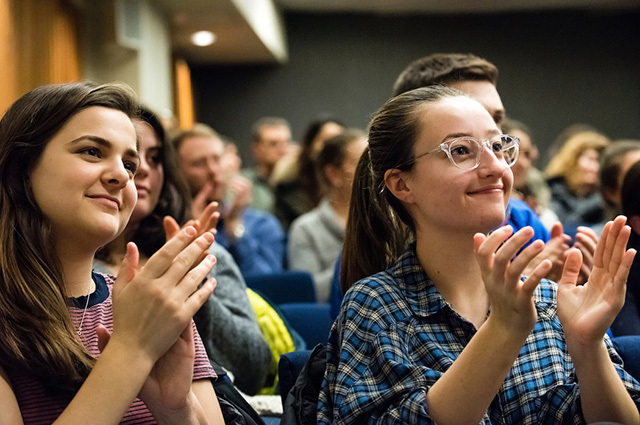 The 2017-2018 academic year was a busy, productive, and exciting time for Tisch College as we expanded our reach and strengthened our efforts to promote civic engagement at Tufts, in higher education, and beyond. We hosted exciting guest speakers, engaged thousands of students through our various programs and initiatives, broke new ground in teaching and research on civic life, and helped lead the national conversation about young people’s role in democracy. It was a banner year for our Distinguished Speaker Series and Civic Life Lunches. We kicked things off last Fall with a visit from former U.S. Ambassador to Israel, Dan Shapiro, and later welcomed to campus former presidential candidate Howard Dean. We also hosted progressive leader Neera Tanden and conservative pundit Bill Kristol for something all too rare in today’s political climate: a respectful, engaging debate between ideological rivals. Check out our YouTube channel for full video from many of our events this year! Our student programs are increasingly rewarding, transformational avenues for Jumbos to engage with local, national, and global communities while growing as civic leaders. Our Tisch Scholars, JumpStart core members, and STEM Ambassadors continue to leverage in-depth, yearlong partnerships with local schools and organizations into opportunities for profound civic learning and on-the-ground impact. Twenty-four students just completed a year of service learning through Tufts 1+4—by far the largest group in the program’s three year history. And, for the second straight year, more than 125 Tisch Summer Fellows are enjoying substantive internships focused on the public good in New York, Greater Boston, and Washington, D.C. They are working in congressional offices and government agencies; at nonprofits focused on social justice, health and education; and at think tanks and philanthropic foundations. A handful of Fellows are working at a school in rural India, and others received support for summer projects in a half dozen countries around the world. The Tisch Fund for Civic Engagement also handed out nearly $25,000 to 35 student led-initiatives on campus and beyond. Several new Tisch College programs, launched this academic year, are expanding the ways in which students can contribute to civic life at Tufts. Through the Tufts University Prison Initiative, Jumbos are strengthening educational opportunities for incarcerated people. The Tisch College Dialogue Fellows program trains students to effectively lead difficult conversations on divisive issues. Students involved in both initiatives were among the 20 Jumbos we honored with the Presidential Award for Civic Life. And we inducted nearly 200 graduating students from all across the university into Honos Civicus on the program’s 10th anniversary. In a year when young people took to the streets, and when we are now months away from consequential national elections, Tisch College academics and researchers redoubled their efforts to study civic engagement and provide a scholarly foundation for the fight to strengthen democracy. Our two main research organizations released new tools and data that are already informing political learning and engagement. Last Fall, Tisch College’s Institute for Democracy & Higher Education (IDHE) provided more than 1,100 colleges and universities in its NSLVE study compressive reports on the voter registration and turnout rates of their students for the 2016 election—and released aggregate national data. This Spring, our Center for Information and Research on Civic Learning & Engagement (CIRCLE) unveiled the 2018 Youth Electoral Significance Index, which highlights the states and districts where the youth vote could swing this November’s elections. Our researchers frequently shared their expertise on youth engagement in national media, offering insightful commentary and analysis on television, on radio, and in print. On campus, we continued to integrate civic learning with teaching and scholarship. Hundreds of students took one of over two-dozen courses created our supported by Tisch College, on topics as diverse as mass media, political campaigns, community organizing, entrepreneurship, and civic science. We also created several new initiatives to create or strengthen the connections between civic life and various disciplines: the Tisch College Initiative on Social-Emotional Learning and Civic Engagement, and the Program for Public Humanities. We also increased our support of the Metric Geometry and Gerrymandering Group, which uses advanced mathematics to combat unfair redistricting. These efforts culminated in the creation of a new Civic Studies major—believed to be the first in the world—which will begin accepting Tufts students this Fall. We’re proud of everything we accomplished this year, and we’re grateful to all the students, faculty, staff, partners, and friends, across Tufts and beyond, who helped us advance our mission. The work we do at Tisch College is only possible because of the philanthropy of our supporters, and we are grateful for their generosity. We are already hard at work planning next year’s events, developing new academic offerings, and expanding programs in order to deepen our reach on campus and in our communities. See you in September for another exciting academic year!